This is a great biner - big and beefy but easy to handle. Use for high strength applications, abrasive environments and "two man" rescue rigging. 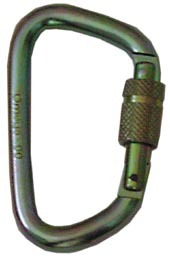 Multi-purpose 7/16" MODIFIED D will handle about any task for team or individual rescuer. Choose either Screw-Lok or Quik-Lok (turn locking collar 90 degrees to open gate) strength: 11,215 lbf (53kN) - exceeds ANSI/OSHA & NFPA minimums. Made in USA. wt: 12.2 oz size: 2.5" x 4.25"